My Technology Mission this week is to manage/consolidate/delete photos on my phone. I used the DiskUsage app to reanalyze how much space pictures were taking up on my phone. I then double checked that Google Photos had my photos backed up. 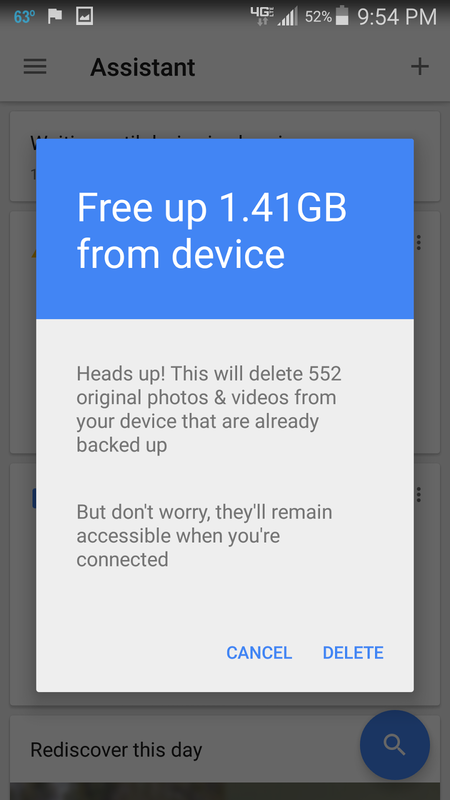 After verifying this, I let the Google Photos app delete pictures on my phone that had been backed up (See the picture on the left). I also manually deleted photos/screenshots/saved snapchats. At the time of writing this, Google Photos is the #5 Top Free App on the Google Play Store. When you take a picture, a high quality version of the photo can be uploaded to Google's servers. There is no limit on how many photos you can do this with when the pictures are saved as a high quality version. There is a limit on photos stored on Google's servers that are saved at the original size/quality the photo was taken at. For someone who only has 9 point something gigabytes of storage on their phone, Google storing my photos is really helpful.